1. The Spa Shower – Let it Rain! 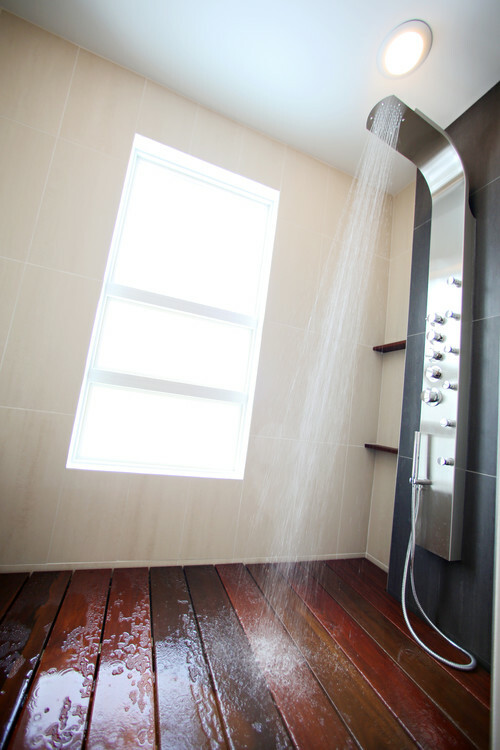 Body sprays, rain showerheads and hand showers will give a bath loyalist a reason to stand up and relish the latest in shower fixtures. 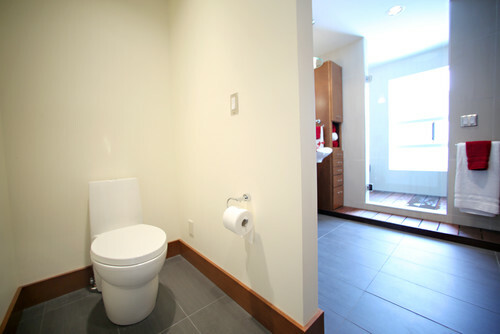 The master shower is gaining more square footage in the overall bathroom floor plan — it’s a shower room, not a stall. 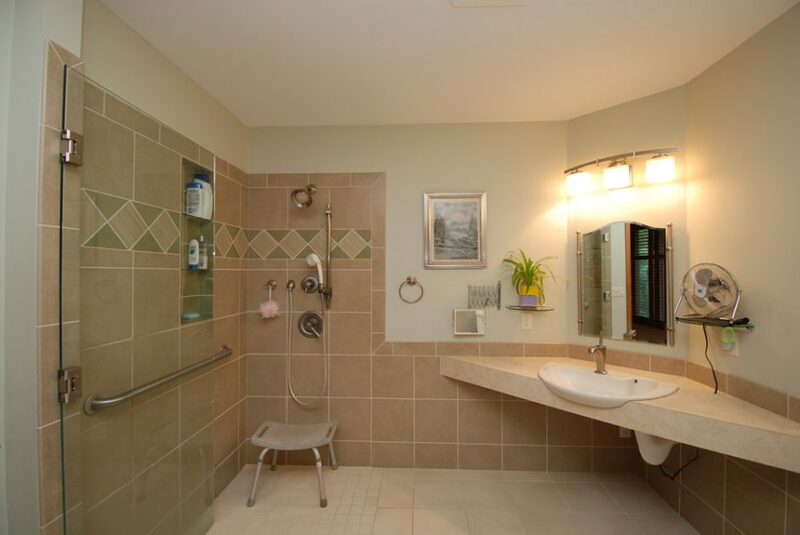 And the area is completely tiled and often features a bench and nooks for storing soaps and towels. 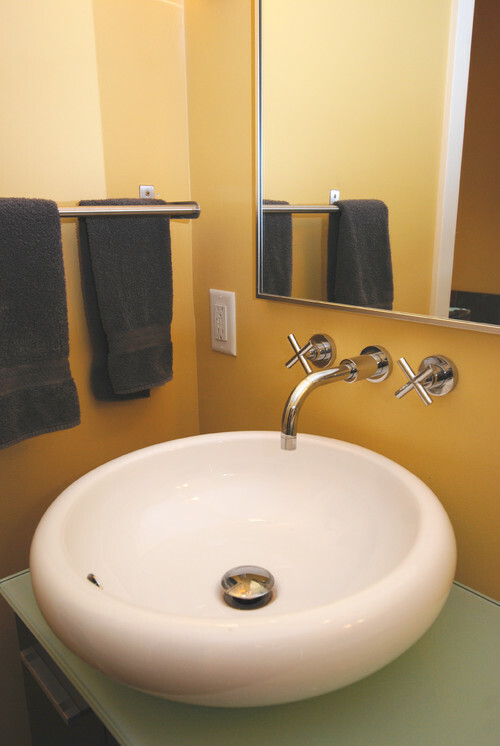 Double vanities gain storage and give him and her some personal space when a tall cabinet is installed between the two bathroom sinks. Outlets installed inside drawers and doors mean appliances can be plugged in and ready to use, yet concealed to avoid cluttering the countertop. Who wants to get a gaping view of the commode when walking into the bathroom? That’s exactly why hiding the loo wins points in remodeled bathrooms. You don’t need a large space to privatize the toilet. In fact, you don’t even need full-wall coverage. Fogged glass, a half-wall or a decorative screen can provide enough of a hideaway without making the space feel claustrophobic. The basic vanity cabinet gets a sophisticated overhaul with sculpted legs and paneling that helps the piece look like a piece of furniture rather than a bathroom cabinet that holds a sink. Neutral bathrooms evoke a mood of relaxation, but that doesn’t mean having a blah backsplash. Work recycled glass or metallic mosaics into the tile design, using specialty tiles as the “jewelry” — this will also keep the project from sabotaging your budget. Take the tile from floor to ceiling for a seamless look that’s also easy to clean. Rather than the corner Jacuzzi tub, which takes up valuable square footage in a master bathroom, opt for a smaller, deeper tub that is large enough for two people but will slide against a wall or next to a shower room. Tubs aren’t essential in the master bath. In fact, some people are choosing to expand the size of their shower stall instead and leave the tub for the family bathroom. And as for tub bubbly, check into heated water jets that are essentially self-cleaning and won’t cool down the bath by shooting air into the water. Go ahead — indulge yourself with a chandelier above the soaker tub. Amp up the ambiance in your bathroom by installing backlighting around a mirror — it’s not functional light, but it provides soft, warm lighting. Toe-kick lighting underneath cabinets serves as a handy nightlight. And do install a dimmer on your central ambient light (the fixture that fills the room with light). Design a bathroom that allows you to age in place by focusing on aesthetically pleasing yet highly functional features: a curbless shower, a shower bench, grab bars that can also hold towels, slip-resistant tile (and larger grout lines on shower floors) and proper lighting. You can save water and still get a powerful flush with today’s water-conserving commodes, available in a range of prices from economy to luxe (with bidet functionality — a bonus). Ready to upgrade your bathroom? At Chuba, we provide excellent remodeling services. Our dedication to quality service using top-quality building products and high level of attention to detail, we will be your partner in producing your dream bathroom. Contact us today for an estimate!